A micro business is a small business that does not have to be registered at CIPC. A micro business can be started with very little money and is easier to run than a small business because there are fewer rules and regulations on micro businesses. A micro business is meant to help people that want to start very small without having to go through all the trouble that normal small businesses must go through. A micro business is usually run by one person that owns the business. You will be able to employ someone to help in the business if you can afford the salary for the employee. You can register your own micro business, but if you have a problem with registering your Micro business on your own, we will help you when you attend the training for your chosen micro business. Yes, we do provide full training with every micro business opportunity! Starting small and growing bigger every day is the easiest way to start a micro business. We will assist you in completing the forms and registering your micro business when you do the training. 1. Your bar coded ID Document. 2. Provide proof of residence. 3. You must be a South African Citizen. 4. Once you have the documentation we will assist you in completing the IT77 form. Your name will be used as the business name. You can add trading as……… to your name. Do not worry, we will help, just make sure that you have the documents as listed above. When your business starts to grow bigger, you can upgrade the business to a CIPC registration or PTY (LTD). After registration is done you can now make and sell any lawful product or service that you wish. On this website you will see many micro business opportunities. We know that some of the businesses listed on TRIMO cost more than you can afford to start a business. That is why we want to introduce you to micro ideas for micro businesses. Look on the right hand side of this website where you will find micro businesses that do not cost a lot of money or a lot of effort to start or run. Good news. Although to have an education is a good start, you do not need a matric certificate to start your own micro business. Micro business training has flexible dates and times and will take place strictly by appointment. Tell us what you want to do and when you want to come for training and we will accommodate you as far as possible. This arrangement is only for micro business start-ups as these types of businesses are easy to learn and start and only takes up one day of your life. You will find a list of micro business ideas that is highly profitable. All business ideas comes with training and backup. Backup means lending a helping hand if you get stuck. You will get a certificate of completion for every micro training course that you attend as well. 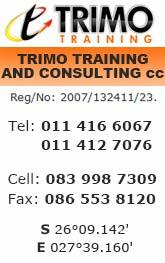 Micro business training is a new concept on this Trimo website. The list of micro business opportunities will be updated as the micro business opportunities are developed, so visit us regularly to see what we are up to. Micro courses will only take one day to complete and it can be done over the weekend, but you must make an appointment for the training. The list of micro business ideas are situated on the right hand side of this website underneath the picture of the eye. With all micro training you will receive the names of where you will find everything to start the micro business. To help advertise your micro business we will provide you with free listings on the internet in our TRIMO WEB DIRECTORY. If you have your own ideas of a micro business that you want to develop, let us know, we might be able to make your dream come true. Micro businesses is like Pay as you go. You only pay for what you need, when you need it. Your business, your time, your future. Invest in it!